If you want to wow your friends and family with a dish packed with intense flavor and free of allergens, then you have to try this! It falls into our 30 minutes or less group, making it truly one of our favorite go-tos for a healthy, quick and super satisfying meal. 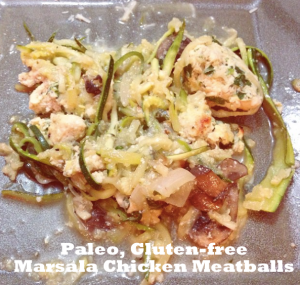 We have replaced all flour, gluten and dairy with allergen-free ingredients, and use zucchini noodles in place of pasta, so this healthy dish is gluten-free, dairy-free, soy-free and Paleo. Score! If you haven’t cooked with zucchini noodles yet, the main thing to watch for is not over cooking the “noodles”, so we toss the ribbons in at the last 5 minutes with this recipe so they have just enough time to soften up, but won’t lose their coarse texture that’s reminiscent of pasta. The easiest way to prep the zucchini noodles is with a mandolin or spiralizer (both will link to the ones we bought on Amazon). The mandolin is simple to use, once you get used to it, but just be careful to avoid the sharp blade, and definitely don’t let your kiddos use this one! If you prefer a spiralizer, this is our favorite! Sometimes I can be a big baby about the mandolin and want to use something easy, without sharp edge to worry about cutting myself on. I can’t wait to hear what you think about this recipe, so please share your comments below! 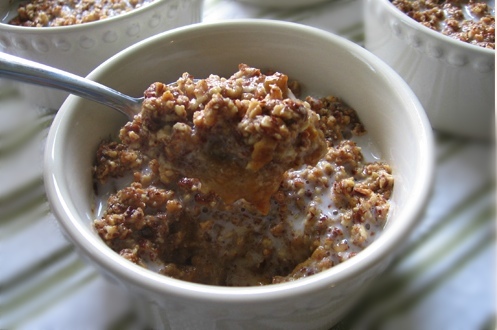 In a large bowl, mix together 1/4 cup almond flour, coconut milk and 1 tablespoon marsala. Let soak for 5 minutes. Add the chicken, manchego, egg, parsley, 1/2 teaspoon of the salt and the pepper. With your hands, gently mix together the ingredients until just combined. Form into tablespoon-size balls and place on an oiled baking sheet. Broil for 5 minutes, or until the meatballs are beginning to brown and are just barely cooked through. In a large skillet, heat 1 tablespoon olive oil over medium-high heat. Add the mushrooms and cook, stirring with a wooden spoon, until the mushrooms are brown on all sides, about 5 minutes. Add the onions and the remaining 1/2 teaspoon salt and cook for another 2 minutes. Lower heat to medium and stir in the remaining almond flour and 1 tablespoon olive oil. Add 1/3 cup marsala wine and stir until smooth. Whisk in the chicken broth and simmer for 5 minutes. Add spiralized zucchini noodles to sauce and mix to coat. Add the meatballs and simmer for an additional 5 minutes to let the flavors blend. Serve hot, garnished with grated manchego. Sometimes I’m lazier than others about making Sunday a food prep day – I’m a ‘Sunday Funday’ kinda girl so I rarely want to spend the day prepping food for the week. Yesterday was one of those days, so I want something quick and easy to prep that would give us some options throughout the week. When you’re following a Paleo lifestyle, it’s best to set aside a day where you plan the upcoming week’s meals to avoid being faced with having to prepare a big meal whenever you’re hungry. So yesterday I convinced my fabulous husband to make his ah-mazing slow cooker ribs so we would have leftovers for the week. Along with a 2lb bag of carrots, these ribs make for a perfect meal throughout the week, and they’re super easy to prepare. Remember, prepping is key to Paleo success, so I would definitely invest in a good slow cooker similar to the one we have which you can find here. It’s relatively inexpensive at only $23.99 and we’ve had ours for years and love it! 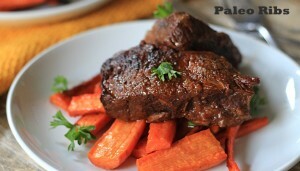 So here’s our simple recipe for delicious allergy-free, Paleo ribs! Note – the Paleo BBQ sauce found here works great with these! 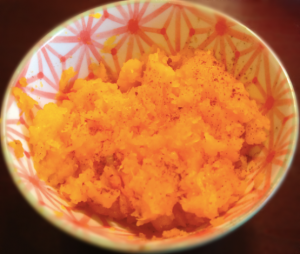 This is a guest post from Megan Cannon, a guest author who shares her experience prepping a variety of allergy-free friendly foods. Throughout the course of the holiday season – which, somehow, only now feels like it’s winding down completely – my family participates in (or sometimes hosts) several large group dinners. These dinners, attended by family and friends from all over, are always fun, but they can be incredibly stressful to put together. While feeding a crowd of people can be a daunting task in itself, there is the additional challenge that our meetings include people with a wide range of dietary restrictions: pescetarian/vegetarian, nut-free, lactose intolerant…you name it, we have it. So this year, I came up with a dish that could be easily changed to accommodate all those special diets, but that is pretty simple to put together. Best of all, it’s one of my favorite (although often underrated) comfort foods: stuffed peppers. These stuffed peppers are extraordinarily customizable, which makes them a definite crowd-pleaser…whether the crowd is a party or a simple weeknight meal with the family. I think they would even transition well as the weather gets warmer, since they are not as dense as traditional stuffed peppers; instead of the typical rice and beef filling, these are packed with quinoa, making them a much lighter dish (but don’t worry – they are still protein-packed and entrée-friendly). Add ingredients together for the Spicy Sweet Sauce in small bowl; whisk until well mixed. As with most sauces, this tastes better after letting the flavors develop together for a little while, so try to let it rest in the refrigerator for about twenty minutes. Prepare a large baking dish by drizzling some of the sauce/marinade into the bottom; set peppers up in dish. Cook quinoa in vegetable broth according to package directions. Meanwhile, lightly sauté shrimp and broccoli in about half of the sauce or marinade. Add remaining sauce to quinoa; mix well. Incorporate shrimp and broccoli into quinoa, then scoop mixture into prepped peppers. Sprinkle the tops of peppers with cheese, if desired. Bake for 25-35 minutes, or until peppers are slightly blistered. Change this recipe as much as you like; it’s really more of a guide, designed to be forgiving for widely varying diets. Add different (or extra) vegetables, swap out the shrimp, change the sauces, do whatever you think is best; just let it come together easily, and enjoy its simplicity, no matter how hectic the rest of the day may be. Note: change this recipe as much as you like; it’s really more of a guide, designed to be forgiving for widely varying diets. Add different (or extra) vegetables, swap out the shrimp, change the sauces, do whatever you think is best; just let it come together easily, and enjoy its simplicity, no matter how hectic the rest of the day may be. My son’s holiday party is today, and the kids were asked to bring in a special treat that symbolizes their family heritage. Since my family tended to center around the kitchen, that wasn’t a problem for me. 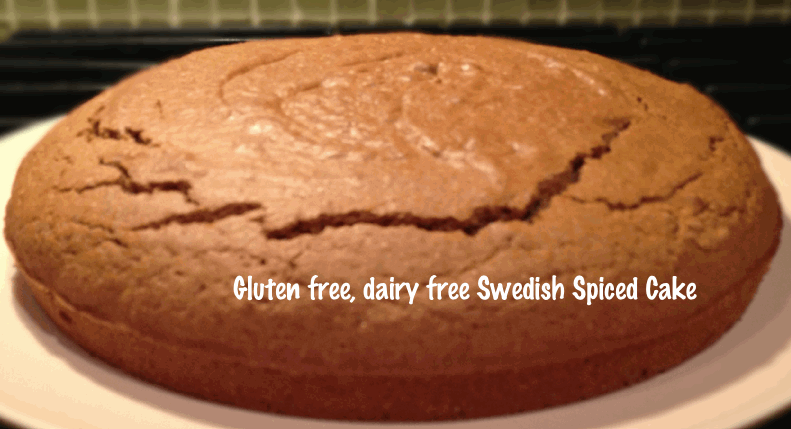 The real challenge was in making an updated gluten-free, dairy-free version that my son could enjoy too. Since he can eat eggs I made this version with eggs, but if you’re following an egg-free diet, you can use your preferred egg substitution (ours is typically 1 TSP ground flax seed and 3 TSP water per egg). If you’re not into flax, here are some other options that have been shared with us. Some I’ve tried, many I haven’t, so I can’t speak for all of them. 1. Preheat the oven to 350F. Grease an 8-inch square baking dish (you can also use a 9×9) with oil and dust with almond flour. 2. In a large bowl combine the almond flour, salt, baking soda, spices, and brown sugar. 3. In another medium bowl combine the melted coconut oil (make sure it isn’t hot or you will scramble the eggs), eggs, honey, maple syrup, and vanilla. 4. Stir the wet ingredients into the dry until thoroughly combined. Scoop batter into the prepared baking dish. 5. Bake for 30-35 minutes or until a toothpick inserted into the center comes out clean. 6. Let the cake cool for 1 hour then serve. Living gluten, dairy and grain free means I sometimes miss foods of my past, especially around the holidays. It’s true that when you cut carbs and sugar from your diet, cravings fade, but what can sometimes stick around are the emotional cravings tied to foods that elicit a happy response. Meaning, the foods from our past that remind us of happy times can trigger a craving that feels just as strong as those which are more of a chemical response brought on by the consumption of carbs and sugar. If you’re curious about how sugar works against you and causes a whole crazy/scary range of health issues, check out this post from The Whole 30 – creators of the leading Paleo 30 day diet challenge. These guys have 10s of thousands of clients who have successfully gone through the Whole 30 challenge, and reversed some pretty amazing health issues from auto-immune disorders to diabetes, and a bunch of stuff in between. So when I notice an emotional craving coming on, I try to have foods on hand that satisfy me in a similar way, without causing a negative ripple effect on the progress I’ve worked so hard to achieve. If you’re like me, and face the effects of an auto-immune disorder coupled with some other genetic deficiencies and a host of food allergies, than you can relate to the feeling of occasionally being overwhelmed by your restrictions. And no matter how devoted I am to health and healing, I sometimes find myself dreaming of the homemade pastries or potato and gluten-ful dishes of my past. So when that craving hit today, I threw a butternut squash in the oven, roasted it for an hour, and out popped a semi-sweet, soft and delicious treat that didn’t exactly kill the cravings, but it helped me feel better! I think the key to sticking with a restrictive diet when cravings hit is making sure you have foods on hand which keep you happy and satisfied so you don’t turn to the bad stuff instead. For me, that means having root veggies and winter squashes alongside nuts and dark chocolate treats to keep my cravings at bay. Here’s a quick and easy recipe for some roasted butternut squash that makes my belly happy. Enjoy! This is a great gluten-free, dairy-free sweet casserole option for the holidays! Using almonds and chia seeds rather than grains, and coconut milk and oil in place of dairy-based ingredients, this is an allergy-free friendly recipe that you can add to your holiday list with confidence that it will satisfy the pickiest (and allergy-free) palette. Since it’s rich in sugar, I don’t recommend this one on a regular basis but it’s a great option for that special menu night. The original post can be seen here, and the author was happy to let us share it with you. Soak chia seeds in water for about 15 minutes, stirring occasionally. Use coconut oil to coat the inside of 6 8-ounce ramekins. 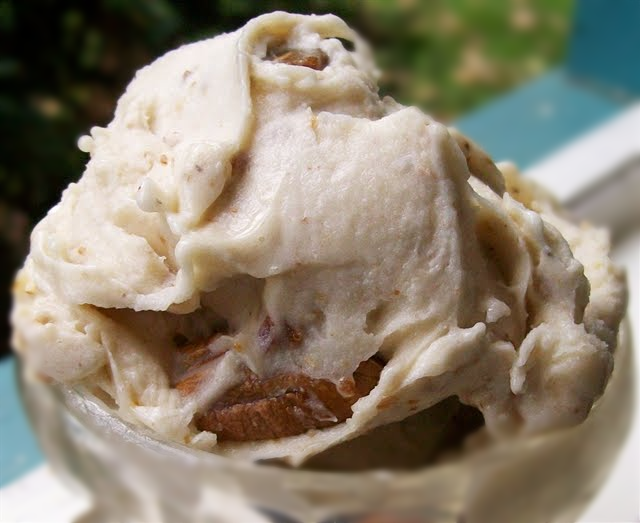 In medium bowl mix soaked chia seeds, pumpkin puree, pumpkin pie spice, sugar, and vanilla. Take a tiny taste and add stevia if you want a little more sweetness. After everything is well incorporated, divide pumpkin mixture evenly among the 6 ramekins. In small bowl mix ground almonds, cinnamon and coconut cream concentrate. Sprinkle evenly over the pumpkin mix. Bake for 25 minutes at 350 using a water bath method. 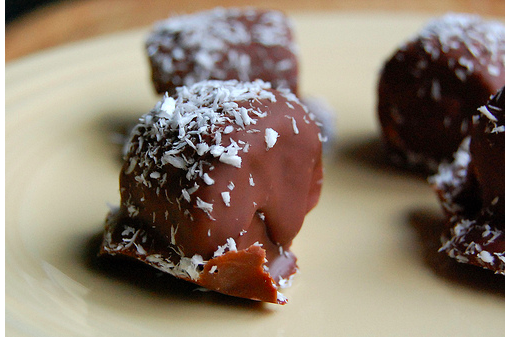 When almonds are starting to brown, remove from oven and pour coconut milk over top. * For the freshest coconut milk make homemade coconut milk. Recipe submitted by Joanne, Delmar, DE to Tropical Traditions Shared with permission from Tropical Traditions. There’s something about Fall that makes me crave warm, gooey foods; foods that satisfy a sweet tooth, or perhaps a hearty soup or chili. However, living a mypaleo, allergy-free diet means I have to be a bit creative to enjoy them without guilt! 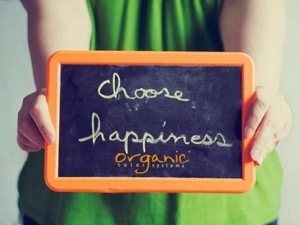 And if you follow my site regularly, you know that I believe whole-heartedly in the power of foods to help us heal. So, while I’m a bit strict in my approach to a healthful diet, I do encourage you to enjoy a cheat once a week. And by a cheat, I don’t mean a gluten-ful slice of cake, or a too-sugary candy; be sure to still focus on healthful foods that satisfy your urge, without setting you back. Whenever I prepare foods to indulge in, like these amazing little peanut butter, banana and oatmeal cookies (which I discovered from my cousin Rita), I freeze the majority of them so I can take a couple out to thaw, enjoying them as the urge hits.And if you’re saving up for a weekly cheat, I can’t think of many cookies I recommend more than these guys! 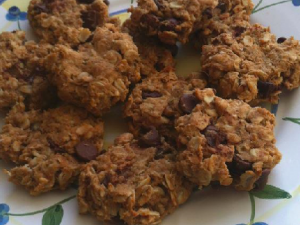 I love the consistency of the oats combined with banana and PB which makes a thick, rich and chewy cookie. 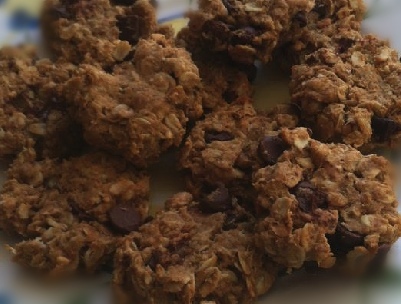 Quick note – these tasty treats contain peanut butter, so if you are avoiding PB you can substitute almond or cashew butter, which will slightly change the flavor of the cookies, but still remains a delish treat! Remember, living an allergy-free life doesn’t mean living without the occasional indulgence, nor does it mean that indlugence can’t still be good for us. With a bit of creativity, you can create healthy, yummy treats that are loved by all – allergies or not! In a large bowl, mix bananas, vanilla, peanut butter and maple syrup or agave into a creamy consistency (best to do with a hand mixer). Add the dry ingredients to the wet ingredients and stir until they are well combined, the batter should be slightly sticky. Place heaping tablespoon-sized balls of the batter onto a ‘greased’ baking sheet (can also place on wax paper) and cook for 15 minutes.